after posting in this thread, you're free to make rps in the neutrals! just make sure they're liquid time, to avoid confusion and complications. Chelae had imagined leaving Gemini many times. She thought that one day she'd look back over her birth home and then run off into the sunset. She'd whisper don't worry about me, don't follow me, and go off into the world to find her own way. So she'd never imagined that she'd be leaving Gemini like this, with all her big sister's hopes and dreams riding on her shoulders. Really, she never imagined she'd be standing just on the northern side of the Wall's entrance, her feed drenched from the morning dew and waiting for the sun to rise. In order to prove she was really serious, Chelae had arrived here just a bit before sunrise. That way she could prepare what she was going to say so that all the adult wolves who she didn't know would think she was super smart and responsible. She was even going to practice by talking to herself while she waited! That plan had failed, though, when she met some pretty blue Ranger lady who was on guard duty at the wall today. The blue lady with the fancy hair was nice but Chelae didn't want to talk to her, or she'd get distracted. When the sun finally began to break over the horizon, Chelae threw back her head and howled for her group to come. She tried not to let how high pitched her still-puppy howl was in comparison to everyone else's. Hopefully they'd remembered and she hadn't needed to howl, but... that was polite, right? To, um, howl and stuff? Yes. Yes it was proper. She was sure of this. First she considered sitting with a nice posture to show off, but when she noticed how it made her look still small even next to the random Ranger lady she decided to stand. Maybe she should stand on the wall! Wait, no, that seemed complicated. Once they'd all arrived, she'd look them over. "Hello," she announced. Wow, that was really great. No, say something professional. "My name is Chelae. I'll be your-" she bit back an uh - "Your leader. And..." Oh crap what was that other lady's name. Margeret? Migraine? Margone? "Margo will be our navigator. Because she knows the way." Yes!!! Nailed it. She hoped somewhere Hyperion would be jealous, and maybe a little bit proud. What else had Auntie- no, Cavalier Avery done at thatrecruitment? Names! Oh yes names. "...Why don't you tell me all your names. So we can. Get acquainted." They could spare a few minutes, she figured. Nausea had twisted in her stomach since she'd left the meeting having volunteered for the Inaria trip. She had had a hard time eating or sleeping for fear that she would get out there and mess up royally. This could be big for Iaera, this could really take off on her doing a good job as a Whisper for Gemini too. It was a lot to deal with, but she was taking it in strides, after all, she WAS excited, her stomach just didn't realize it. She breathed out a heavy sighing yawn, having decided to give herself a small dose of sleeping herbs to make sure she got rest for her travels; for once she'd slept through the night un-interrupted. Thankfully, she'd remembered the proper dosage, and woke just a little before the sun came up on the morning they were to depart for this Inaria. Inaria, she'd heard the name many times before, now she would see the place. How fantastic! The Whisper-slash-Ranger lay for a bit, nibbling on berries and trying to keep her nerves in check. 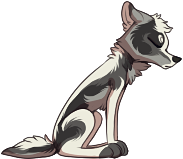 The little wolfdog knew that she mustn't seem spacey or too anxious or they may send her away; how would she ever prove that she was a good useful pack member if she couldn't do the part of her job she was most interested in? How could she prove to herself she was happy if she couldn't? The worries tried to weigh her down but she was determined to shake them off this morning. The woman stepped brazenly from her den, head high and ears perked, violet eyes filled with intention. She was to get a bath and look nice, presentable, to make a lovely first impression on whomever she had yet to make a first impression on. As dainty as she was, she looked like a real little lady when she was all cleaned up, despite a slight snaggletooth. The young woman had tall shapely ears, a lean face lined with curving fur near it's base, deep chest and long legs in proportion to the rest of her, a thin fluffy tail. The tan and gray was lucky to have taken after her mother, and had quite the athletic figure as well. Iaera had just finished grooming herself when the call sounded out, tentative? Or was she hearing things? Regardless she shrugged and began to move towards the caller, a girl named Chelae if she remembered correctly-- which she did, she thought while beaming proudly at herself. When things were down in the dumps for her, the Whisper took quite the pride in herself and her ability to work, it was just rare she was feeling up to it. Maybe one day she would feel better? Or at least, better more often than the opposite? Violet eyes blinked away the uncertainty as she approached the girl, standing waiting for the rest of the part to arrive. One by one they would file in, and Iaera would give them each a soft smile after trying to offer Chelae a reassuring look. Quite the big responsibility, the wolfdog mused as she waited. Finally it seemed those that were to set off with her were all here and the girl spoke, it was clear to Iaera that she might not be entirely certain of what was going on at that point. The Whisper would remain quiet however, an offering from one "fake it til you make it" girl to another. "Hallo! My name is Iaera, I am a Whisper and Ranger," purred out in a polite tone, clear, but heavy with a Latin accent. Margo hadn’t seen herself as a part of Gemini, even with Warlock, she had always felt a pleasuring sense of voyeurism. She preferred it that way, in many senses. It was easier for her to understand things when she wasn’t directly responsible for them. She did enjoy her status though, or what she thought she had. She had been trusted with the Inaria trip before, and, even if I child was in charge, knew it was her job to actually get them there. She would show up with the group, lingering in the back of it, waiting For Warlock of course, when he showed up, the small coywolf would smile up at him. She would wait until the group showed up, and they were given the task to say who they were. “I’m Margo” she would say, albeit a bit testily, they should already know who she is, and who each other were. The kind addressed them by name. “It will take us three days to get there if we stop to rest every night. This isn’t an urgent mission, so, if our leader thinks it’s a good idea, I would suggest that as a base plan. “ She says simply, she isn’t sure what she should say with this child leader there—so she would leave it at that. Waiting for the others to show up, to list their names so they could get on with what they needed. so I put down blue instead cos it's closest there's to grey in the categories. Doe Eyes you should stay at home licking batteries. and the guests on today's quiz are celebrities. but the answers to these questions mean everything. hey hey hey! the next leg of the trip will be coming up soon so try to get in here first!! He is not, in any sense, fit for duty. Warlock is smart enough, even with his head full of cotton and bees, to understand his own limitations; his life has been defined by them, led by them, ruined by them. The twist in his hind leg had always been an excuse for his size, for his physical inability, but he’d at least had his mind – now there is a piece of him that worries that has been taken from him, too. It is enough that his chest no longer rattles when he walks for too long. It is enough that he his here, and home, and dedicated with immediate insistence to the prospect of his duties; he is a Whisper, still, and surely that can make sense when nothing else does—? Warlock turns to Margo as he approaches, settling at her shoulder and flank as if time has not passed between them, and as though his presence here makes sense. At least with her beside him, he understands where he should be; he presses his nose, just briefly, to the fur at the base of her neck, and then faces Chelae with an expression made emotionless for how those red eyes are blank, and his mouth a loose void around his words. Something in his chest flutters and stills. Inaria. The timber has not left the packlands since their migration. He remembers how he had tried to be brave, then, and wonders if he feels an echo of that now – or if it is not bravery held in the still hollows of his heart, but some detached distance that masquerades as such. He is not fit for duty, but that realization does not stop him. I crack the codes, you end the war.